Get pampered with your bridal hair and makeup trial. The trial includes airbrush makeup application to prepare for the big day! Please bring photos. * Get pampered with your bridal hair trial. The trial includes one hair style to prepare for the big day! Please bring photos. Travel on location $1 per mile roundtrip. One fee per artist. photographers and venues in the business. Call (408) 280-5377 or email iheartbloom@icloud.com to see if your date and time is available. Bloom hair and makeup coordinators will view your details, check our artists and stylists availablity for your requested date and time and contact you. As the bride you may book a trial run. We will schedule an appointment at our San Jose location for your requested services. As the bride, you have the option to book your date and come in later for a pre-trial. Please call or email for details. ​Bloom does not require a deposit to hold your date. A signed service agreement will be required to hold your date. In order for our scheduling coordinators to reserve enough time for your date, we need the agreement prior to holding your date. Brides want each detail to be perfect for their big day—especially when it comes to themselves. From head to toe, this includes everything from strategically placed wisps of hair to the colour of beading on their shoes. A trial run is suggested for a wedding or special event as it gives you, the client the opportunity to determine exactly what you want for the big day. The trial run ensures that you will like what you get on your special day and leave nothing to chance. At this appointment we will discuss what type of makeup and hair style is desired, and what headpiece or bridal hair accessories will compliement your look. Bring photos of your dress as a reference. Relying on verbal descriptions can be too vague at best, and leaves much room for interpretation. One person’s up-do is another person’s beehive. Communication is essential so that you get what you want, and so that everyone knows what it will takes to make sure you love your hair and makeup. If there is a problem at the end of the trial day, there is lots of time to schedule another appointment to accommodate any needed alterations. Our artists want to be part of making the bride beautiful, and want you to be thrilled with the look we have created for you. ANY REASON IS A REASON TO GET BEAUTIFUL! Date Night, Attenting a wedding or special event, Flying somewhere fun, Night out with the girls, COME GET BEAUTIFUL! Bloom estheticians use airbrush makeup which lasts for up to 16 hours! All you need to touch up is your powder. Updo or Curl on Dry Hair. ​​​​​You have questions? We have answers. What location do i go to for my trial? Do you come on location for the wedding day? Yes, we continue to offer on location services. A travel fee will be charged. We will come on site on the day of your wedding. Must have a party of 4 or more. Do you offer both hair and makeup? 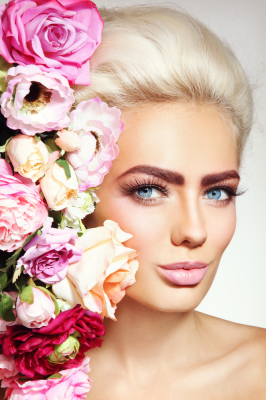 Yes, Bloom has a team of professional hair and makeup artists. Sarah Pena, Owner of Bloom, is the director of the hair and makeup team. When you inquire about your date, we will set you up with the hair and makeup artist who will be working with you on your wedding day based on availability. How soon before my wedding should I book? It is strongly recommended that you book as soon as possible to secure your wedding date. Our brides typically book their wedding date 4 - 12 months in advance. Am I required to book both hair and makeup from your bridal team? No. In our experience, some brides already have a hairstylist but just need makeup serices and vice versa. You are not required to book both services from us. We are here to accomodate you in any way we can depending on our availability for your requested service(s). Most brides love the conveniece of doing both out of one location. For the quality and caliber of our work, our pricing is very competitive. We understand that planning a wedding can be extremely costly and that budgets do need to be taken into consideration. However, considering how important the bride's hair and makeup is and how small the cost of hair and makeup services are in relation to other aspects of the wedding, we strongly encourage you to shop your hair and makeup services primarily on quality rather than cost. Do you offer a preview appointment? Yes, we strongly recommend that you book a preview appointment (trial) for your makeup and/or hair. The preview will ensure that the wedding day runs smoothly and that you will be completely satisfied with your look. We recommend that you come in for a preview appointment before you decide to book so you can ensure you are happy with the artists who will be servicing you. You can always do a second appointment closer to the wedding date if you decide to go with another look. The artists who will be doing your trial appointment are the same artists who will be working with you on your wedding day. Some brides choose to book without a trial. Can I bring someone with me to my trial appointment to help me? You are more than welcome to bring someone with you. Due to the limited space at our location, we ask that you limit your guests to no more than two. Is the price of the trial applied to the wedding day balance? No. We charge separately for this appointment because we take a lot of time with you at this appointment. It may take longer than the wedding day. As working professionals, this is how we make our living. Do I have to do a preview? It is strongly suggested that you have a preview appointment. If circumstances do no allow for you to have a preview, we will happily do the wedding without one. What if I do not like what you do at the preview? One of the most important parts of the preview is honest communication. Our girls are wonderful and they are capable of doing any makeup look on you. The stylist truly wants you to be happy and will encourage you to be honest with her. That being said, in the rare case that you are completely unhappy and you feel as though you can not come to a resolution, you are not obligated to use us on your wedding day. How does the artists know what style is best for me? That is one of the great things about using a company like ours who specializes in weddings. Part of our job is to help you pull your whole look together if needed. There are so many factors that go into determining your look such as, your personal style, the style of your wedding, your jewelry, what your dress looks like, what is going to look best on you, etc. Your artist is going to give you options, help you to take different things into consideration so that you can feel at ease in your final decision. It really depends on how many services you are getting done as to how much time we alot. Another great reason for going with our company is that we have the timing down to a science. The bride generally takes 45-60 minutes per service and the girls approximately 30-45 minutes per service. How much experience do the artists have? Each girl comes to us with different experience. Each artist that joins our team must pass a strict process and is rigorously tested before she is ever allowed to work with a bride. Will the artist do more than one look at the preview? Your artist is going to consult with you to determine which look is going to be the best based on all of the factors. We really do try and narrow it down to one particular look. This is part of the artist’s job. If there is ever a time in which we do two different looks on a preview it is usually when a bride is trying to decide between two looks and can not decide. Will you come out just for bridesmaids? Yes, there may be a minimum number required depending on the time of the year and availability. We require a signed service contract to hold the date. Do you recommend everyone in the wedding party get their hair and makeup done professionally? We recommend that your wedding party get their hair and makeup done professionally. Your wedding day is going to be a memorable event. Your photos will last a lifetime for generations down the road. In our past experience, bridesmaids who did not get their hair or makeup done stood out from the rest of the group in photos. Some women are naturally gifted to do their own hair and makeup, but it’s still nice for them to share the feel of getting pampered on such a special occasion. Bridesmaids and guests can pay for their own services or you can offer to cover half of the cost or pamper them on the wedding day as a “thank you” for being my bridesmaid gift. How do I secure my date / Do you require a deposit? We do not require a deposit to hold and book your date. If you want to guarantee our availability for your date, we require you to submit a service contract. There are so many artists out there with great sites and impressive resumes and portfolios, why should I hire you ? While we would agree with you that there are many gifted artists available for you to choose from, we would encourage you to book with us because weddings are our passion and our specialty! We do this because this is what we love to do! We do not service brides a couple times a year, or every now and then… we service over 100 brides per year. Therefore, we know the importance of being on time and reliable for your special day! Something that sets us apart is our own store front. You will also have the opportunity to have your pre-trial done in the comfort of our relaxing and charming boutique. Brides have raved about their experience at our location and love being pampered in such a great setting. Can I stop by anytime to look at your boutique or ask you questions about my wedding day before I decide to book a trial? Our boutique is open by appointment only. We do not have a set schedule at the shop. Our schedules vary depending on our appointments, therefore we highly recommend to schedule a consultation to ensure we are available to sit down and speak with you and answer any questions you may have. If you drop in without an appointment, we may be servicing another bride at that time and may not be available to talk to you in detail about your event or answer questions. Most of our brides do phone consultations with us and are comfortable at that point to schedule a trial. We are here to service you as best as we can and will do our best to give you the full attention you deserve at any of your appointments. What is the best way to reach someone to find out about my availability or answer any questions I may have? Your question or inquiry will be directed to the appropriate staff member.